An analysis of the welfare state from a political economy perspective that examines the effects of aging populations, migration, and globalization on industrialized economies. In The Decline of the Welfare State, Assaf Razin and Efraim Sadka use a political economy framework to analyze the effects of aging populations, migration, and globalization on the deteriorating system of financing welfare state benefits as we know them. 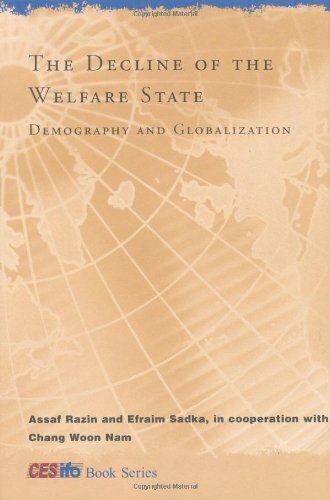 Their timely analysis, supported by a unified theoretical framework and empirical findings, demonstrates how the combined forces of demographic change and globalization will make it impossible for the welfare state to maintain itself on its present scale. In much of the developed world, the proportion of the population aged 60 and over is expected to rise dramatically over the coming years-from 35 percent in 2000 to a projected 66 percent in 2050 in the European Union and from 27 percent to 47 percent in the United States-which may necessitate higher tax burdens and greater public debt to maintain national pension systems at current levels. Low-skill migration produces additional strains on welfare-state financing because such migrants typically receive benefits that exceed what they pay in taxes. Higher capital taxation, which could potentially be used to finance welfare benefits, is made unlikely by international tax competition brought about by globalization of the capital market. Applying a political economy model and drawing on empirical data from the EU and the United States, the authors draw an unconventional and provocative conclusion from these developments. They argue that the political pressure from both aging and migrant populations indirectly generates political processes that favor trimming rather than expanding the welfare state. The combined pressures of aging, migration, and globalization will shift the balance of political power and generate public support from the majority of the voting population for cutting back traditional welfare state benefits.